The story of Hackney Brewery is a yarn, stretching back to the early noughties, where Peter Hills and Jon Swain met while working at The Eagle pub in Farringdon. In 2011, they founded the brewery under railway arches near Hoxton Station in Hackney- making them the oldest brewery in the borough. Even before the appearance of Beaverton Brewery and London Fields Brewery, these two friends were experimenting in cask ale exclusively, initially offering three styles. Since then, they’ve embraced keg and their range has grown and evolved as the brewery found its footing. Still focused on both traditional and modern styles, Hackney has undergone a rapid series of changes in the lead-up to their fifth birthday, which was celebrated on the premises last Saturday. They’ve recently produced a series of noteworthy pales and IPAs, including their tropical number, Kiwi Thunder, a New Zealand IPA that went down favourably at The London Brewers’ Market held in Spitalfields Market last April. It seduced drinkers with dialed-up mango aromas and flavours of tangerine and grapefruit that burst from the glass, resulting in a smooth IPA that was juicy without being too astringent or bitter. Another recent triumph was their Equinox pale ale, part of their craft series, which showcased the Equinox hop (soon to be rebranded as Ekuanot) alongside Chinook and Centennial hops. The Ekuanot hop has some powerfully toothsome characteristics. The beer was heavily hopped, giving off potent aromas of citrus and mango paired with a flavour profile that included melon and lime. This flavoursome pint was lapped up at the Dalston Beer Day on the 30 July, solidifying that Hackney was keeping up with the dynamic and evolving palates of London’s beer drinkers. 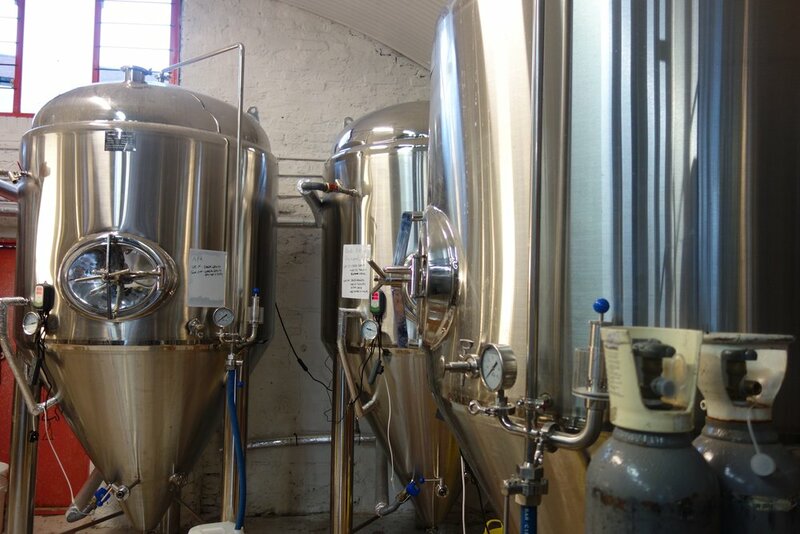 In August of this year, the brewery saw the delivery of new brewing kit including eight gleaming new fermenter tanks - gone were the plastic vats of brewing days past. The new outfit hasn’t ameliorated Hackney’s ability to keep up with surging demand, however. They’re brewing five days a week, two to three times a day. But the beer is changing - and, according to the brewers - it tastes discernibly better coming from the new stainless steel fermenter tanks. Saturday’s birthday celebrations invited locals and visitors in to see the new brewery and enjoy an extensive offering of seven beers on keg and three on cask. The menu included their Little Islands session IPA, a pumpkin ale and their lager. On keg, Kapow!, a tweaked version of their Equinox pale brewed on the new kit, incited nods of approval from attendees and the Chinook pale elicited high praise from weathered cask drinkers. A lively crowd arrived to christen the new brewery and - for some - it was an introduction to Hackney's beer. For those accustomed to drinking in brewery taprooms every weekend, these open days are the only occasion to sample Hackney's beer from the source. This is because the taproom only opens on a handful of occasions each year. The future heralds some developments in quick succession for Hackney. They’ve invested in a costly beer analysis kit to ensure quality control - it tests everything from pH to colour - and are believed to be one of the only breweries in London to have this. They’re also hoarding some port, Madeira and Jim Beam barrels tucked away in a dark corner, promising an interesting foray into barrel aged beer. Finally, there’s whispering of a new stout in the works with a potential mid-November launch date. There’s a series of exciting announcements expected in the coming months from Hackney Brewery. Despite being long in the tooth, it's taken them some time to pull up their socks and join the ranks of East London's most celebrated breweries, but it's about time that we started talking more about their beer. Because we'll be seeing much more of it around London soon.